After the letdown of their last album “Red Carpet Massacre” in 2007, Duran Duran fans have eagerly and impatiently waited for the time the band would regain their signature sound which made them the ultimate party band in the ’80s. With their newest album “All You Need Is Now,” the goal was to return to the group’s roots and provide something that would satisfy die-hard Duranies while still managing a contemporary sound. The album, which was produced by Mark Ronson and features guest vocalists such as Ana Matronic of Scissor Sisters and musical artist Kelis, does not disappoint. 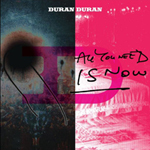 While the album is not exactly the imaginary follow-up to “Rio” as Ronson anticipated, listeners are provided with nine tracks which feature the familiar vocals of lead singer Simon Le Bon and contain catchy tunes that could easily be heard at a dance club. While the album is unlikely to bring in many new fans, upbeat tunes such as “Safe” please by highlighting the skillful counter melody of bassist John Taylor and the outstanding rhythms of drummer Roger Taylor, while “Girl Panic” offers clever chords from the synthesizer played by Nick Rhodes. Although the album is currently available for download exclusively through iTunes, three bonus tracks will be added and released on an in-store album sometime in February.